This past weekend was my beloved little nephew’s first birthday party, and I was asked to bring the cake and some decorated sugar cookies. I’m so there! I also was tasked with making a little smash cake for him so that he could enjoy his first taste of cake too. Done and done! 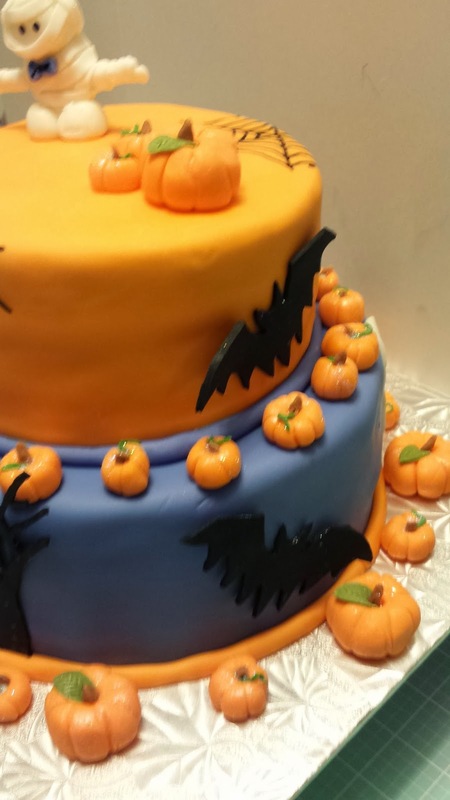 My sister and I used Pinterest to inspire us for what kind of cake would be the most awesome for the party; we must have looked through a thousand pictures between the two of us. We chose elements from a few of those cakes we loved the best, and with a few parameters (non-scary, at least one layer to be chocolate, and for about 25 people), I went to work! 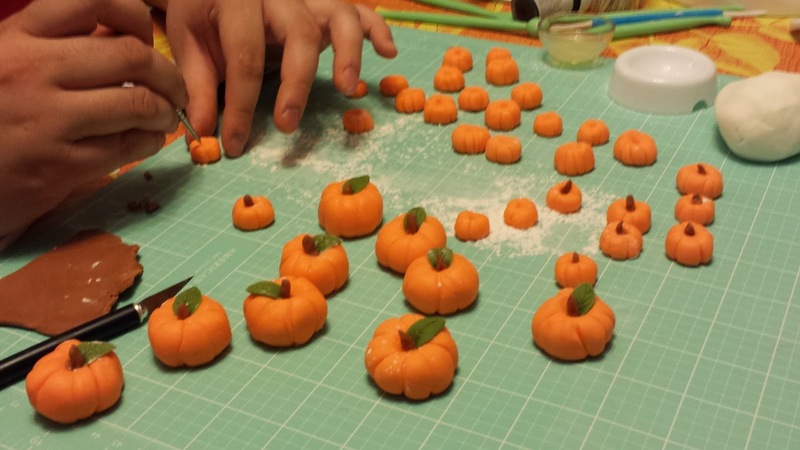 My friend, Erinith, made all of the teeny little punkins (her first time working with fondant! ), and I think she did a fantastic job. Once they had a day to dry out a bit, I dusted them all lightly with Super PEarl luster dust and some holographic white disco dust, and they absolutely sparkled! 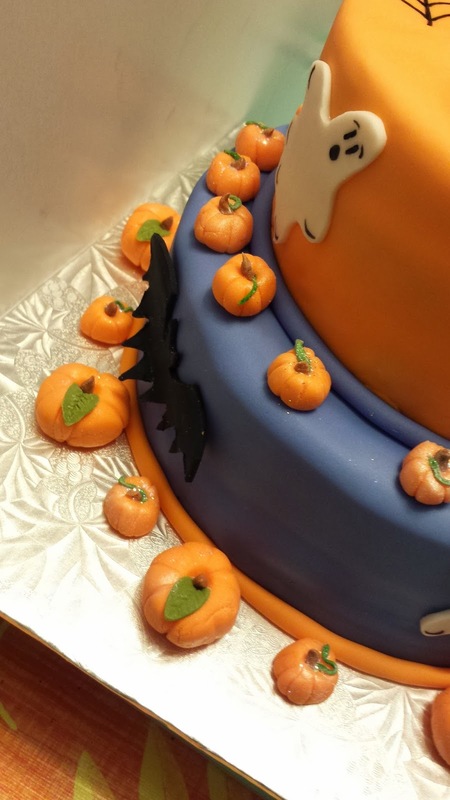 There must have been about 50 or so of these little guys…and I used every single one of them in the final design (except the one that accidentally hit the floor; no “floor punkins” were utilized in this cake design). cake. 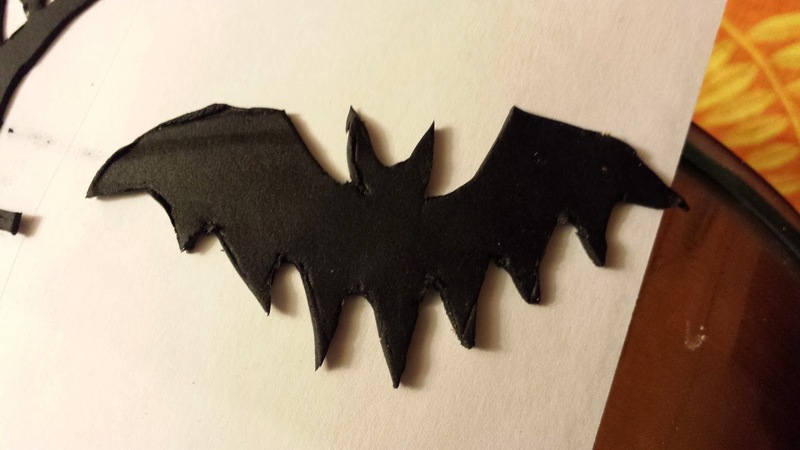 There were the fondant bats, which I made a quick template from some cardboard (I strongly recommend using strong cardstock instead of corrugated cardboard like I did; I had forgotten that I gave away all my cardstock to our Beaver colony for crating purposes and had to make do with what I had on hand). Luckily, I wanted them a little rough-looking, so it didn’t matter that there were some corrugation lines on them when I was done. I set them to dry in such a way that they would curl a bit at the edges, so they would look like they were flying away from the cake once they were glued in place. 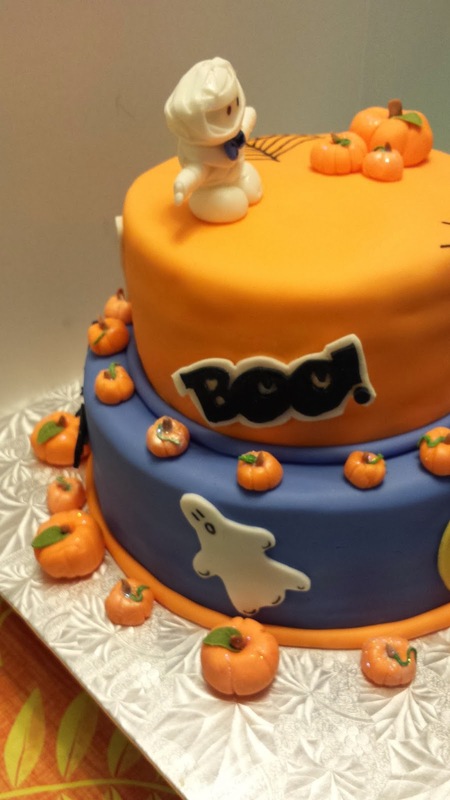 Another 2-D effect was the “BOO!” I wanted to make for the side of the cake. I found a font I liked online, downloaded it, then blew it up to the size I figured would work best on the cake. 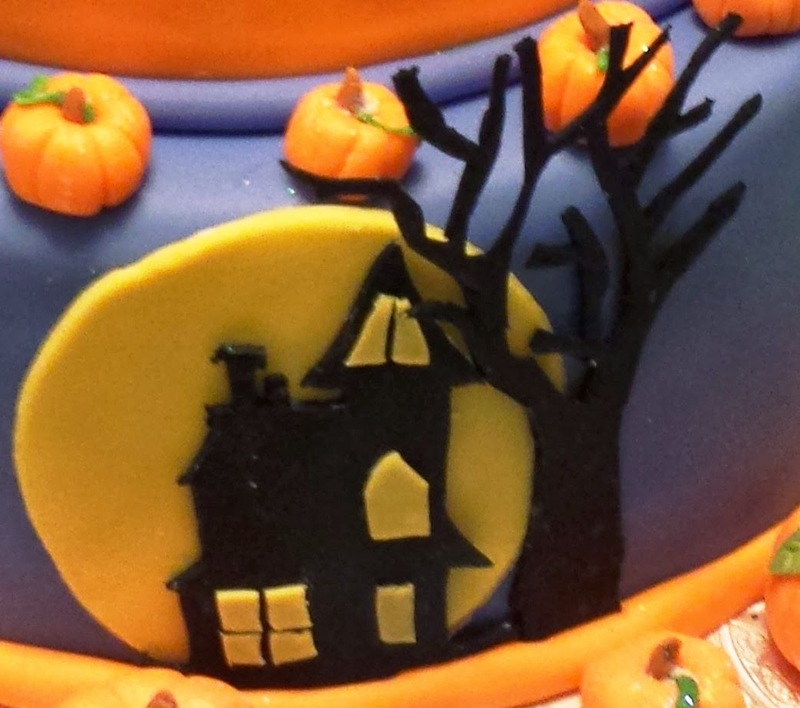 I printed it off, cut it out with an exacto knife, then cut it out of the black rolled fondant, and cut out a larger size from the white rolled fondant. 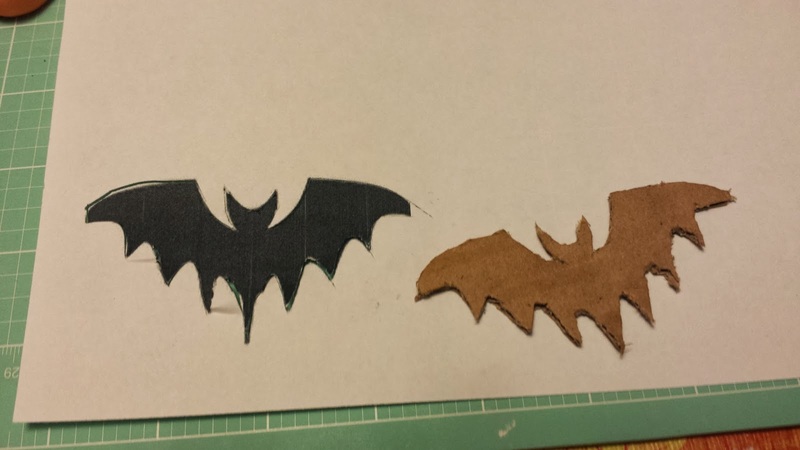 I attached them to one another with some piping jelly, and let it dry before attaching. would fit the contours of the finished cake. I also knew that it was so fragile, I could carefully remove any parts of the design I didn’t want (or wouldn’t fit) by using the exacto knife. 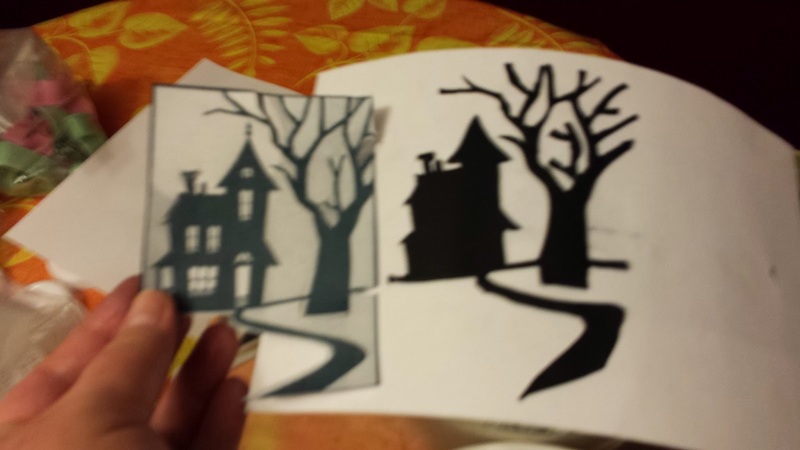 I also cut out a thin circle of yellow and let dry for a spooky moon, and some windows and a door for the haunted house. 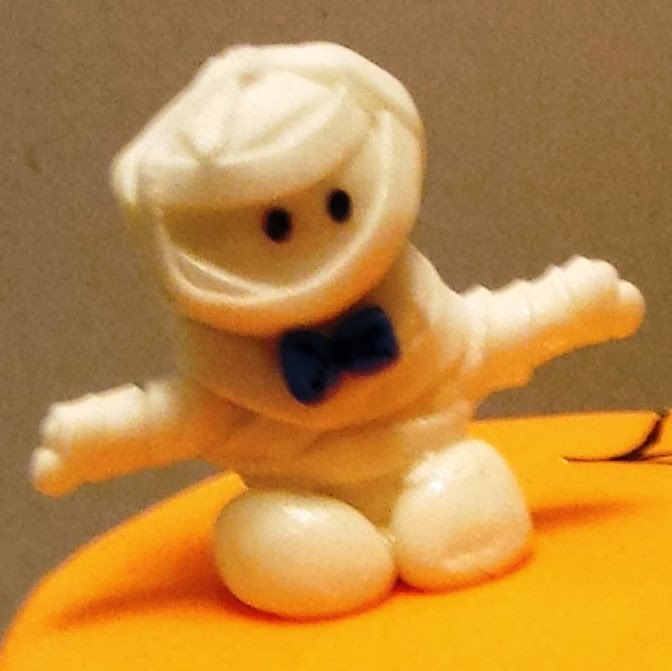 The best little thing I made for my nephew’s cake, hands down, is a tiny little fondant mummy, wearing a cute little blue bowtie! 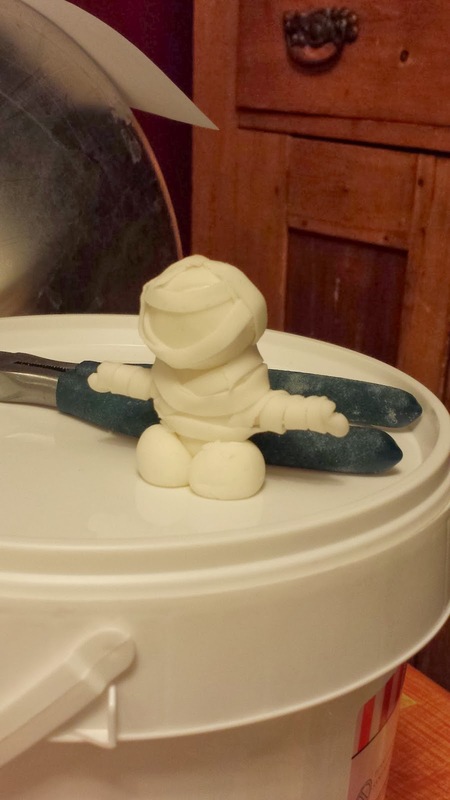 I saw the most adorable little gumpaste mummy on a different cake, and thought I’d take the inspiration and make one for the top of the cake. This mummy is held up by a toothpick through the top to the bottom of the body, with another toothpick through the arms for stability. I don’t normally use non-food items on a cake, but I knew that fondant is so heavy and soft, and I found that my gumpaste had dried out to my chagrin, so I really wanted this little guy to work out! 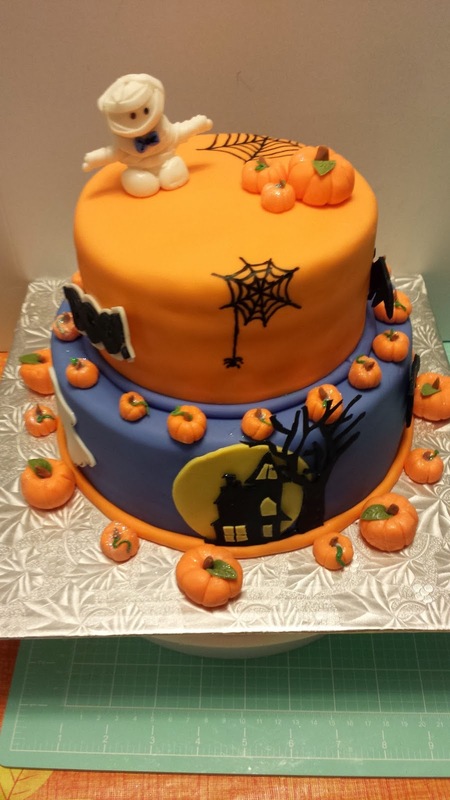 SO, without further ado, here is the Halloween cake in all its gory glory! I left a space on the top in case there was a birthday candle or something that the parents wanted to add to the cake.